So this week, we’re talking about what our essentials are that go in our bag. Because I have a very nice desk that is the only place I really work besides home, my daily bag contains my wallet, keys and phone. It used to have a book, but my phone does that now. And since everything I’m working on is on a remote server, I don’t need to take documents back and forth. Since this would be a very short post otherwise, I decided to instead go through what I bring to academic conferences. Even if I’m not presenting, I bring my laptop in case someone who already saw my presentation has questions and I want to bring up slides. I have a USB version of my presentation in case there is a computer they want us to load everything on to, or my laptop is dying. Because I work on a Mac 90% of the time, I always save a PDF copy, in case PowerPoint decides to eat or corrupt my equations. However, I am incapable of taking good notes on any electronic device I own, because I like to draw pictures. 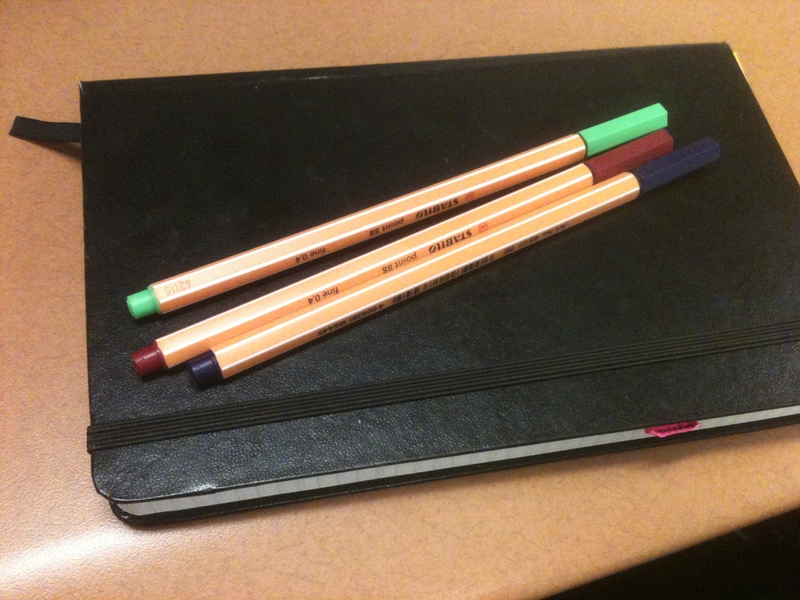 Hence, the Moleskin and the pens. I started packing snacks after being in too many session that ran late, leaving no real time for lunch. I also bring water, because while many places think to offer coffee, and even tea, apparently no one is expected to want a cold beverage. I try to make my outfits as interchangeable as possible, to minimize how much I need to pack. I still don’t think I will ever get down to the two pairs of pants, two shirts, one pair of shoes = 4 outfits approach that some of my male coworkers do. I’ve come to realize the I should always pack two pairs of shoes after one too many rainy conferences. It’s one thing to have wet feet all day: it’s another when your shoes are still wet the next morning, and it’s not raining anymore. Dry shoes are an amazing feeling after that. What do you bring to conferences that you don’t normally carry around?